Join us for a different theme each week! Pinnacle Summer Camps are the perfect Activities for Kids Kansas City offering the right balance of physical activity and mental stimulation. Each camp includes time in the gym, organized games, crafts, a snack, and more. Ninja Camp for Kids 2019 is offered every Wednesday from 1pm - 4pm. Ages 5 and up can stay all day with our Summer Day Camp Options! What goes on at ninja camp? Our Ninja Warrior training program involves a combination of agility, ropes, bars, hanging obstacles, and a 10 foot tall warped wall. Each camp involves a variety of different challenges focused on a specific ninja theme. 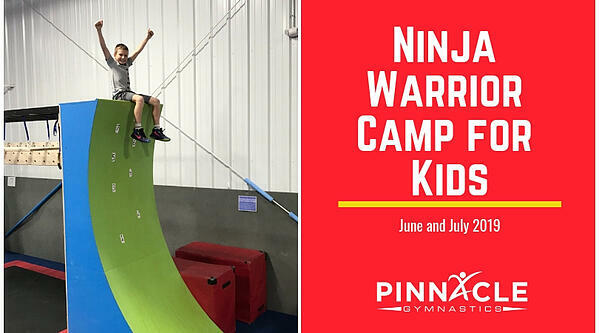 Join us for all camps to set your personal record at our culminating camp - the Ninja Warrior Competition. Become stronger and more confident ninjas! July 10 - What's new with Ninja! Ninja just received a facelift! Come check out our next ninja obstacles! Can you handle the toughest of the ninja obstacles? This is your final chance to practice before our Pinnacle Ninja Finals! Can you become the next ninja warrior? Today we will crown our Pinnacle Ninja Warrior champion! More Great Reasons to Enroll in Ninja Camp? Ninja camp is led and planned by our Youth Fitness Manager, Greg Henning. Coach Greg uses his expertise in fitness as both a coach and post-collegiate athlete to keep participants challenged, smiling, and reaching for their personal best. Our Ninja Camp for Kids is a Pinnacle favorite and frequently fills to full capacity. Don't delay - enroll today!